We are proud to support the brand new South Bay/Manhattan Beach chapter of PFLAG with a shopping percentage day! 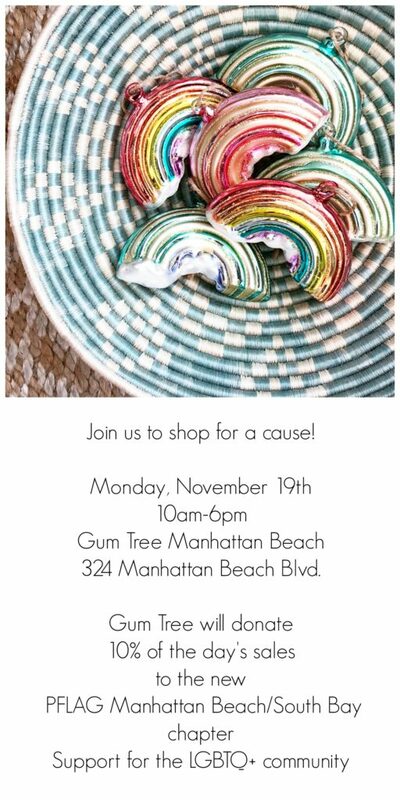 All day Monday, November 19th in our Manhattan Beach Shop, we will donate 10% of sales to this amazing group of supportive, accepting parents and friends of the LGBTQ+ community. Their mission is to support families, nurture acceptance, and build community, and we think that sounds pretty great. Everyone is welcome, come on down. More information about this newly formed chapter of PFLAG can be found on their Facebook page here. If you can’t make it, but would like to donate, please click here!